Tomorrow (February 21) is World Pangolin Day and to mark the occasion we’re pleased to publish this guest blog from Darren Pietersen, chairman of the African Pangolin Working Group, a not-for-profit organisation based in Africa which undertakes research and conservation activities on pangolins in various African countries. ‘Cute, scaly, walking pinecones’, ‘mobile artichokes’, ‘unique’, ‘medicinal’, ‘mystical’ and even ‘mythical’ – these are some of the terms people have used to describe pangolins, or scaly anteaters. Despite an appearance which might suggest they are reptiles, pangolins are actually mammals. In fact, they are the only mammals to have a covering of scales rather than the more typical fur. Like other mammals, pangolins give birth to live young and, depending on the species, may give birth to two offspring per year or only a single offspring every two years. There are currently eight extant pangolin species of which three occur in Asia, one in India and four in Africa. In addition to their scaly covering, all pangolins have one other aspect in common – they are all threatened with extinction. The Sunda and Chinese pangolins are listed as Critically Endangered by the IUCN, while the Indian and Philippine pangolins are classified as Endangered. All four African pangolins (Temminck’s ground, giant ground, white-bellied and black-bellied pangolins) are listed as Vulnerable. Habitat destruction (such as the large-scale logging in Laos previously reported by EIA) has played, and continues to play, a large part in the increased extinction risk of pangolin species; however, local and especially international trade in the species are by far the largest threats. 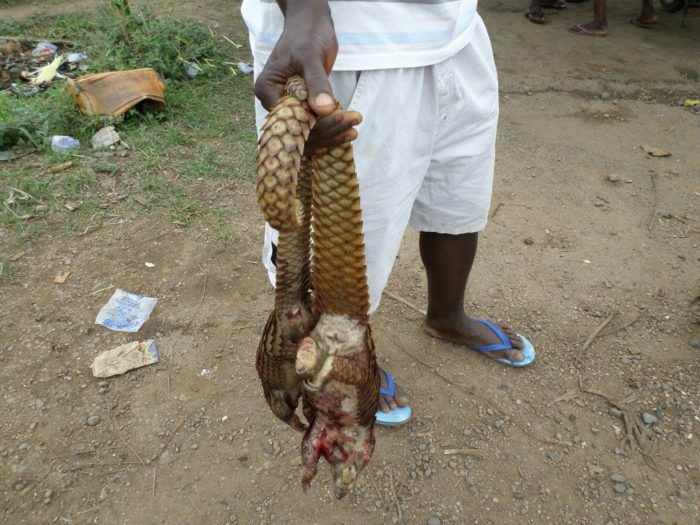 Pangolins are regarded as a culinary delicacy in Asia and are also hunted extensively in Africa for bushmeat markets. In recent years, evidence has come to light that large volumes of bushmeat are being illegally exported to various European cities, where some restaurants specialise in bushmeat, while large expatriate communities also purchase this bushmeat directly from suppliers. 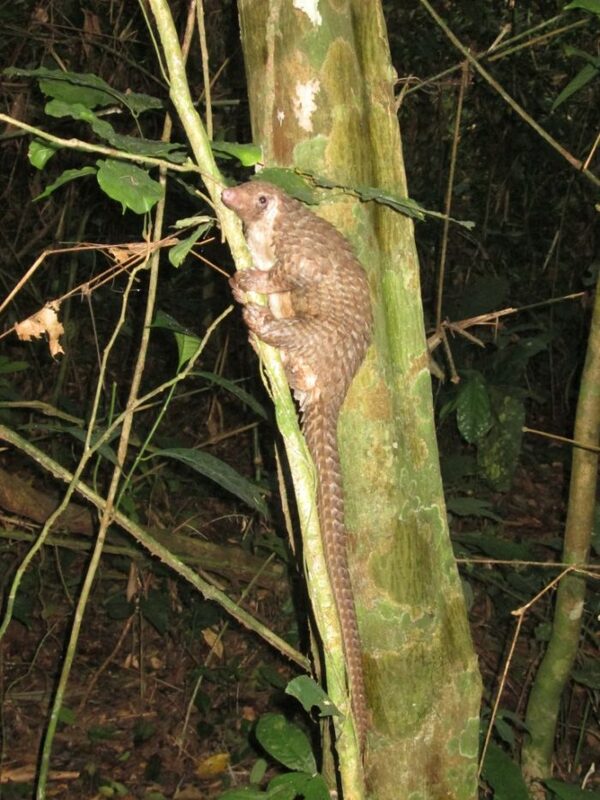 Pangolins are also used extensively in both traditional Chinese and African ‘medicines’. The scales are the most commonly used derivatives, often being dried before being powdered and inhaled to treat chest conditions, or made into a paste and applied topically. Scales are also carved for decorations and are used as talismans, and it is believed that keeping a pangolin scale on one’s person affords both physical and spiritual protection; some even believe that carrying a scale makes one bullet-proof (when asked how he was able to shoot and kill the pangolin from which he sourced the scales, the individual making this claim replied simply that it was because “the pangolin did not believe that he was bullet-proof”). The cultural beliefs and medicinal uses involving pangolins are numerous and varied, and although some uses are specific to certain cultures the majority appear to be universal. These cultural beliefs are also ingrained and form an integral part of the various cultures, having been passed down from generation to generation over many centuries. The cultural use of pangolins most likely did not have a large historical impact on the survival of these species but in more recent times improved transport and communication networks have made people aware of the monetary value of pangolins while also affording traders an unprecedented opportunity to source and ship pangolins and derivatives. The human population has also increased dramatically, meaning more people are vying for access to continuously diminishing natural resources. The recent collapse of Asian pangolin populations has also seen a rapid shift, with traders increasingly sourcing pangolins from Africa. Not only are the African pangolin populations comparatively large (although by no means large enough to sustain this trade) but Africa’s laws, and their enforcement, are comparatively lax. It is estimated that between 117,000 and 234,000 pangolins were traded between January 2011 and December 2013 alone. 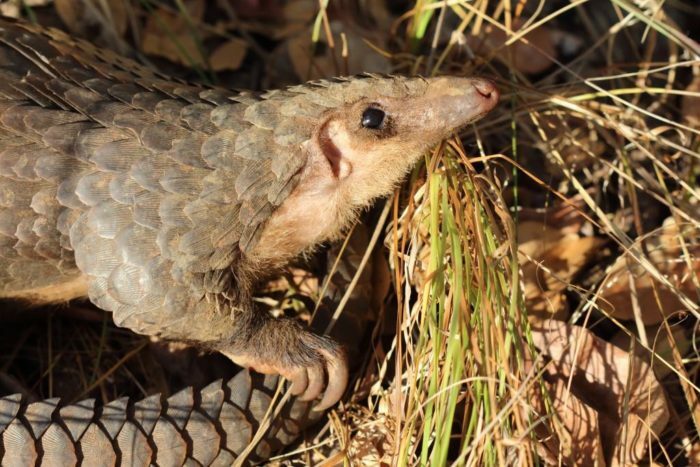 In southern Africa, there has been a 57-fold increase in the number of recorded cases involving the illegal possession of, or trade in, pangolins in the past five years. Pangolins are now the most traded group of wild mammals in the world and if decisive action is not taken soon, some pangolin species may even beat tigers and rhinos to extinction. The commercial farming of pangolins has been punted by some as a possible solution to supply the enormous demand. However, pangolins have such a specialised diet – they feed exclusively on ants and termites, and then only on specific species – that any such venture would be near-impossible. Pangolins are also extremely difficult to maintain and most individuals die soon after entering captivity, or experience a greatly attenuated lifespan compared to their wild counterparts. There are some notable exceptions and some institutions have attained remarkable success in maintaining, and occasionally breeding, pangolins in captivity. 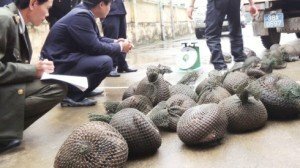 This has been done strictly to facilitate the husbandry of confiscated pangolins until they are sufficiently healthy to be released back into the wild, and for conservation purposes should it be necessary to breed a species in captivity to bolster the wild population. In addition to the dietary and husbandry issues, their slow reproductive rate would mean an enormous number of pangolins would need to be maintained to supply the demand, which is not feasible. Furthermore, if a captive pangolin breeding program were to be established it is likely such a facility would act as a conduit through which illegally poached pangolins could be laundered into the legal trade, which would result in a further increase in poaching. In additional to the ethical and husbandry concerns surrounding pangolin breeding farms is the fact that many people who use traditional Chinese or African ‘medicines’ believe that the muthi (traditional medicine) obtained from captive-bred animals is far inferior to that of wild individuals. Thus even if captive-breeding was to prove successful it is unlikely it would ever decrease the demand for wild-sourced pangolins. In an effort to raise awareness for these amazing yet little-known mammals, World Pangolin Day is celebrated on the third Saturday of February every year. You can do your bit for pangolins by telling family, friends and colleagues about these unique creatures and the numerous threats they face, and you could also support one (or more) of the organisations fighting to ensure their continued survival. If live in a country where pangolins and their products are traded, you help by not purchasing any pangolins, pangolin derivatives or medicines containing pangolin products. And if you know of any illegal trade in pangolins, report it to the local law enforcement agency or the IUCN Species Survival Commission Pangolin Specialist Group.